Treeditions came about from the marriage of a woodworker and a weaver. We love to create beautiful things: furniture, weaving tools, woven and wooden gift items. All of our products are hand crafted in Appomattox, Virginia, USA. Please contact us for whatever reason: we love to chat with our customers. Retail and wholesale inquiries are always welcome. Our site is coming along; more product links will be added as shopping pages are ready. For now, you can purchase any product by contacting us. Please note: our shopping cart is new, and occasionally someone has trouble with it on mobile devices. We apologize for any inconvenience. Please contact us with any questions, to order and product, or with any concerns. We are happy to do PayPal invoices too. These beautiful oval box designs are a classic, which the Shakers perfected. 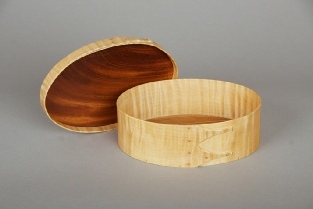 Ours are not only made of the traditional species, cherry and maple, but also from exotic and interesting woods. 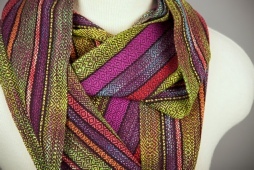 Hand woven textiles make great gifts, or a treat for yourself. We have some unique offerings. Patricia Morton offers beginning to intermediate weaving instruction, as well as specialty topics. Please contact us for more information, or see our Events page. 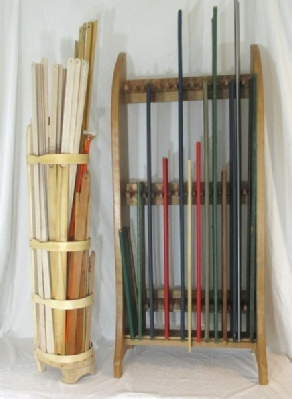 Our handmade wooden tools are designed to enhance your enjoyment of weaving. We work in beautiful hardwoods, usually cherry or maple. We have recently added furniture for the weaver’s studio. Store your tools in style!